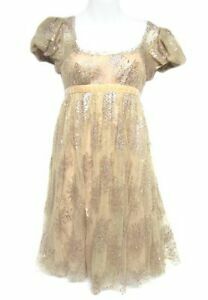 Marchesa sparkling pink champagne blush lace dress. Puffy cap sleeves. Scalloped boatneck detail. Hidden back zipper with hook and eye closure. Color: Blush Pink. Material: Self: 62% Nylon 38% Mylar Lining 1: 100% Silk Lining 2: 100% Polyester.